If the PA insists on building freeze to continue talks with Israel, said Avigdor Liberman, they may find that there are no talks at all. Among those demands, said Liberman, was a building freeze in Judea and Samaria. When Kerry broached the idea of the frame work last year, Liberman said, the PA specifically did not demand a building freeze, but only the release of terrorists, a condition Israel had fulfilled to the letter. 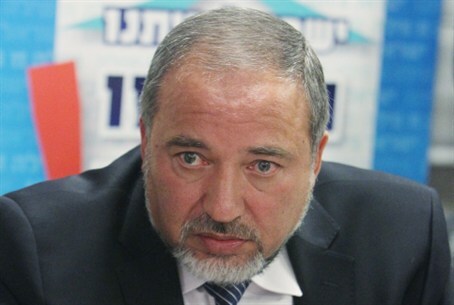 “Israel will not agree to any conditions for the continuation of the talks,” Liberman stressed. The fourth and final round of terrorist releases – which is to include several terrorists with Israeli citizenship – is set for the end of the month. On Wednesday, PA chief negotiator Nabil Sha'ath in an interview with Al-Arabiya television reiterated the PA's “three noes” - no recognition of Israel as a Jewish state, no compromise on demands that descendants of Arabs who fled Israel in 1948 to return to Israel, and no talks until Israel agrees to release more terrorists and freeze building in Judea and Samaria. Liberman is set to leave Thursday for Rome, where he will meet with foreign ministers, including Kerry and Russian Foreign Minister Sergei Lavrov, and where he will present Israel's positions on the PA demands, and lobby officials to push PA chief Mahmoud Abbas to begin compromising. At his meeting with Netanyahu Monday, United States President Barack Obama promised Netanyahu that he would push the PA to match any Israeli concessions in the Kerry framework. Netanyahu made clear to Obama that for the talks to continue, PA Chairman Mahmoud Abbas would have to be prepared to make concessions, reports said. Obama undertook to push the PA leader, who will be in Washington in two weeks, as he had done to Netanyahu, White House officials said. "It's not as though the Palestinians are going to get a pass," they said. Kerry has been trying to push the sides to agree to a framework agreement that will allow for the peace talks to continue beyond the set nine-month period, which expires in April. Few details have been made public of Kerry’s proposed framework, though Thomas Friedman of the New York Times published some alleged details of the plan, which, he said, will call for a phased Israeli withdrawal from Judea and Samaria based on the 1949 lines, with "unprecedented" security arrangements in the strategic Jordan Valley. The Israeli withdrawal will not include certain settlement blocs, but Israel will compensate the Arab side for this with Israeli territory.